Rural Revolution: We're working on it! Honest! I've received many kind inquiries from people interested in purchasing one of our tankards as a Christmas present, and folks are wondering when we'll have a retail page up and running. Well my goodness, opening a retail page is turning into a big fat hairy deal. eBay is a logical place to list tankards, but costs a whole lotta money (everyone has their hand out, wanting a cut), so eBay is out. We can open a free webpage using PayPal, but the big issue is the fact that each and every one of our pieces is different. This fact - that all our pieces are unique - is apparently something PayPal isn't equipped to deal with. For instance, let's say we list fifty tankards. Customer A wants tankard #23, so he orders it. That's fine, but then PayPal would not indicate that tankard #23 is gone. So when Customer B decides he wants that exact same tankard, PayPal would process his order and take his money for a product that doesn't exist. Grrr. There are programs available that will indicate when an item is out of stock, but between the specialized program and the cost of PayPal, we're looking at something like $60 a month to run a "free" webpage. Grrr. So what we've decided to do for the moment (since we have limited time to figure this stuff out before Christmas) is put up a temporary retail page and operate it on a first-come, first-served basis. If three people want the same tankard, then the person whose email we receive first will get it. Awkward, yes, but as I said we're running out of time. After Christmas, when we have a bit of a breather, we'll get this whole thing figured out on a more permanent basis. LOL, this is why we're a wholesale business, not a retail business. It's a whole lot easier! That said, I can't tell you how flattered we are at the interest shown by readers who want to obtain one of our pieces. Thank you! Patrice;I set up a site for a friend to sell her paintings a few years ago.You might want to check out "Zen Cart" it is free and easy to do with one of a kind things just set the inv. number to 1 it will remove it from your listing or it just will not take another order for it,depends on how you sit it up. ya know ya could freely put your photos and descriptions of each on facebook...there you can have alot of photo albums and photos..all you would be basically doing is showing albums of your labor/work/ and if anyone wants to buy they could msg you on facebook or through e-mail.. ive done this with some of my quilts.. every now and then i get a message that says someone likes my quilt and how much is it or what is the size or whatever..i get back through e-mail and let 'em know how much and what the shipping will be.. i don't take credit cards but will take a check or money order to be sent in advance..once check is recieved i ship the same day and sent e-mail notification to the buyer. of course, i don't depend on this to make a living but it helps when i am in a generous mood and want to give back such as charity or whatever. You might want to try etsy.com. It is a website like ebay, but for hand crafted items. Items are listed like ebay, so it is a single item system. Also, since it is only for hand crafted, you have a much more focused customer base. Listings last longer than ebay listings, by several months, and I'm thinking it is cheaper than ebay too. 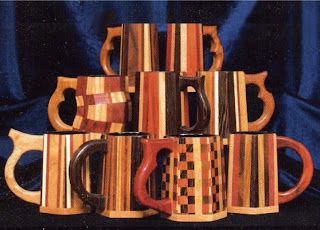 You might also check into upillar.com to sell your tankards without paying any fees. I haven't used it but heard about it on Glenn Beck's program. I know you are gettin' lot's of ideas thrown at you Patrice. Amazon offers a professional selling package free for a month, then $39 a month after that. The free month would get you up to Christmas and see how it works. Buyers would not have to be members of the site (like Facebook). I would like to see you sell individual tankards, but understand the problems it causes. Patrice, just read today's column on WND...Excellent! I am going to save it and send it around. You are right--we never heard about the communal living, I'm not sure in my 3 short years of homeschooling I even read about it then. Thank you and have a wonderfully "selfish" Thanksgiving as you enjoy God's blessings and the fruit of your hard work! I ordered bullets from them on Tuesday and got them Thursday.